What’s The Best Keto Pizza Crust? 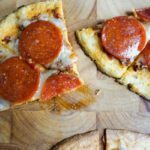 Update(2/13/17) – Since originally writing this post, we’ve developed a few more pizza crusts that also have claims to the keto pizza crust crown. We now have a delicious deep dish low carb pizza recipe that you might want to give a try when trying to decide on the real champion! Also, in a few weeks we’ll be releasing an incredible chicken-based keto pizza crust. Spoiler Alert! That one might just be my favorite. Pizza falls somewhere between the theory of relativity and the moon landing on the scale of human accomplishment. It is the embodiment of perfection, and not so coincidentally, it is one of the first foods we keto-fied. I mean we had to…or why continue living, right? With our sights set on the goal of making a keto pizza that we wouldn’t be ashamed of actually calling “pizza”, we began researching the options. We found two variations that were, by far, the most popular. In the right corner, Fathead Pizza! And in the left corner, Cauliflower Pizza! I know what you’re thinking… one is named “fathead” and one is named “cauliflower”, do you even have to try both? Cauliflower tastes like socks and fathead is pretty much the coolest name ever (whoever came up with it has a career in…naming things? ), don’t waste your time. Well it just so happens that we like wasting time and eating keto pizza, so let the games begin! Low Carb Pizza Crust-Off Video! Anyone who has done a poorly planned science project knows you need to come up with some kind of rating system to make your experiment look legit. This is ours! If you’re not familiar with our blog or YouTube channel, the content is created by two of us (Matt and Megha) and we will both be weighing in to get to the bottom of this issue. We’re going 60% on taste. You could argue that this should be an even higher percentage, but 60% is about right for us. We talked about the factors that go into our decision to make a given crust on a certain night, and taste is definitely king, but nutrition and difficulty are also going to factor into our decision. Nutrition is something that is always somewhere in our decision process, but might weigh more/less heavily depending on how strict we are being at the time. Difficulty is a constant factor. The easier something is to make, the more inclined we are to make it. Let’s get after it! The process for making these two low-carb pizza crusts is very different, as detailed in the YouTube video above. I don’t think it’s a stretch to say that the Fathead recipe takes this category easily. Microwave, stir, form. It’s a three-step process and you’ve got yourself a tasty thin crust keto pizza ready to go. The cauliflower pizza crust is a bit more involved. You have to turn the cauliflower into rice, microwave, drain, mix, form. There’s a couple added steps in there. The advantage though is that it is much easier to get this cauliflower pizza crust into the shape of something that looks like a pizza. With the Fathead dough you’re pretty much going to have to settle for “unrecognizable blob” unless you want to cut it into a specific shape or try something else fancy. The nutrition pictured is for the half recipe depicted in the video. The recipe listed below is a full recipe…so twice as much! The nutrition on these can be tough to give a rating. Each has their place in a well rounded keto diet, but the macro profile on them is completely different. As you can see, the Fathead crust is much more calorie dense, but also more keto-friendly as far as carbs are concerned. That is counterbalanced by the fact that the cauliflower crust packs in a few servings of vegetables as well as being lower calorie. So nutritionally each of these pies is very different. We’ll reveal the final tally at the end! This is what it all comes down to. If you can’t infer from the previous paragraphs, I’ll just spoil it and tell you that we’re neck and neck up to this point. I’d love to say that one of these truly dominated the competition, but it was really quite close in just about every aspect. The taste is very close, and may come down to your personal preference. If you’re a die hard New York style pizza fan, then I can almost guarantee you will prefer the Fathead crust. If you’re more like me and you like a thicker crust then you’re going to prefer the cauliflower crust. So let’s reveal our rankings, tally them up, and crown the Best Keto Pizza Crust. Whew, that was a close one! These two keto pizzas came down to a photo finish, and honestly it’s hard to say that there was truly a winner. By no means are we going to only be making one of these from now on. Both will continue to be mainstays in our kitchen. We each preferred the taste of different low-carb pizza’s, but that could have a lot to do with our preferences. The real separator was nutrition. As much as you may want to throw caution to the wind when pizza night rolls around, it’s nice to have a healthy pizza crust once in a while. Both of us opted for the lower calorie, veggie filled cauliflower pizza crust. We definitely recommend that you give them both a try and let us know which one you prefer! We’ve got one more recipe for you to consider before making your final decision! Just recently we got to experimenting with a deep dish recipe and we’ve finally nailed it. 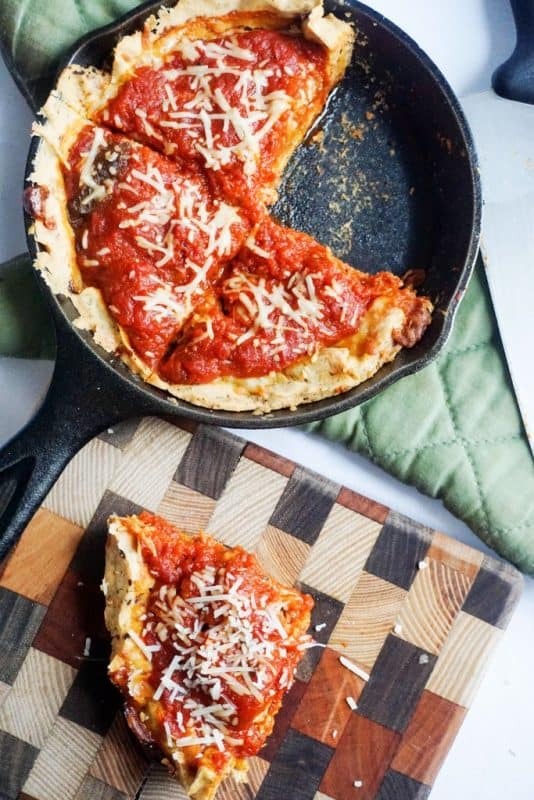 This low carb deep dish pizza will transport you straight to Chicago! The recipes we used are posted below. In the video we made a half recipe, but we’ve listed the ingredients for a full recipe below. These are not recipes we came up with, like the rest of the recipes on our site. These are recipes that can be found all over the internet, we just wanted to put them to the test to let you know what’s up! Combine mozzarella cheese and cream cheese in a bowl and microwave for 30 seconds. Take out of microwave and mix. Microwave for another 30 seconds and mix again. Bake for 12-14 minutes at 425 degrees. Remove from the oven, add desired toppings and bake for an additional 5-7 minutes. Place cauliflower in a food processor and pulse until it forms a powder. Some lumps are ok.
Microwave cauliflower powder for 3-4 minutes. Place the hot cauliflower in a dish towel and squeeze out all of the water. Place the dry cauliflower in a mixing bowl. Add mozzarella and Parmesan cheese to the cauliflower. Lightly mix. Add the egg and continue to mix until loosely combined. Once it starts to stay together, use your hands to knead the dough. Place dough on a nonstick baking sheet and form the shape you want. Bake at 450 degrees for 8-11 minutes. Remove from oven, add desired toppings and bake for an additional 5-7 minutes.